As I mentioned in a previous post, I am a huge fan of podcasts. Full stop. In fact, I binge listen to podcasts the way others binge watch Parks and Recreation or The Office. Seriously – I love podcasts. I love the wide variety you get from the world of podcasting. Whether you’re looking for a deep dive into pro wrestling, parenting, gardening, or the search for happiness, you better believe there’s (at least) one podcast that fills just that need. I also love the connections that builds between the listening community. It’s so fun to discuss the latest episode’s ideas and topics with other listeners each week. I value the accessibility of the podcasting hosts. Even those with millions of listeners continually reach out to their audience. They ask questions and interact with their fans and get to know their audience. In fact, every podcaster I follow demonstrates a real interest in their community, and I find that incredible. And finally, I love that podcasters are real. They’re honest. They get down to business. They’re willing to open up. And they share their stories. 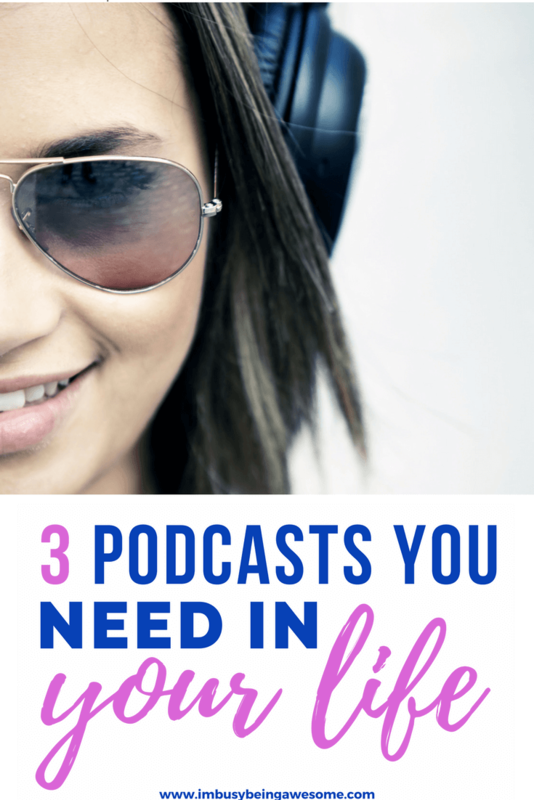 In my post last August, I shared 4 podcasts you need in your life. Today I’m here to share 3 more. And I think you’re going to LOVE them. If you’re a regular on I’m Busy Being Awesome, it won’t come as a surprise to you that Gretchen Rubin’s podcast appears in my “top podcasts” list. I’m a big supporter of all her books, and her podcast is one more layer of her wonderful work. Happier is podcast that Gretchen hosts with her sister, Elizabeth Craft. Living on opposite sides of the country – New York and Los Angeles respectively – the two sisters meet virtually once a week to discuss tips and strategies on how to be happier. Each episode is somewhere between 25-35 minutes long (give or take), which is an ideal length for your commute to work, a walk with the dog, or getting dinner ready. Each episode is also filled with several different segments: happiness hacks, “try this as home,” listener questions, etc. With this type of variety, Gretchen and Elizabeth tackle happiness from every angle, which makes their podcast relatable to a wide variety of listeners. If one segment doesn’t speak to you, the next one likely will. You can feel the affection these two sisters have for one another, and that warmth extends to the listeners. What’s more, because they’re so close, their dialogue is completely natural. It feels as if you’re part of the conversation. Every 10th episode is deemed an “extra special” one. In these special episodes, Elizabeth and Gretchen might interview an interesting person, do a deep dive into a hot topic, dedicate the entire episode to listener questions etc. It’s a fun way to shake things up and keep it interesting. Branching off from Happier, Happier in Hollywood is a podcast hosted by Elizabeth Craft and her writing partner Sarah Fain. But wait! Before you scroll to the next podcast in my list thinking, “I don’t live in Hollywood,” just remember – I don’t either. Nor do I aspire to be a screen writer, actor, director etc. So why do I love this podcast so much? Why is it in my “top podcasts” list? Several reasons. Although Sarah and Elizabeth focus on topics in Hollywood, the thing I love is that these topics apply to most other careers as well. Because let’s face it, Hollywood isn’t the only place that we might describe as back-biting, superficial, chaotic, unpredictable, and fundamentally insane. What’s more, if you know someone in the business of film or television, this podcast is especially enlightening. My sister is a screen writer living in L.A., and it’s so interesting to learn more about her world through this perspective . Like Happier, Happier in Hollywood has excellent rapport as well. Liz and Sarah have been best friends since childhood, and writing partners for 20+ years. Like the Happier Podcast, it feels like you’re joining in on the conversation as two girlfriends talk about how to deal with challenges and find the happiness amidst the craziness of work and life. Something that I really love about this podcast, is the women’s openness. They share their advice and experience freely with their listeners. And I imagine this is even more beneficial for those working in the industry. People don’t always like to talk about their struggles. Not everyone is willing to share their advice on how to succeed. But Liz and Sarah do. They’re willing to talk openly about topics in hopes of helping their listeners find happiness and success in any way possible. If you’re looking for strategies to improve your work-life balance, find sanity in the insane, and generally “be happier” amidst the chaos, this podcast is for you. If you’re an aspiring artist (writer, actor, director, producer etc.) in the industry, this podcast is for you. If you ever feel like you’re reaching burnout or your job seems like “too much,” this podcast is for you. A much different approach than the previous two podcasts on my list, Side Hustle School is a daily podcast. The host, Chris Guillebeau, is the author of (among other books), The Art of Non-Conformity, The $100 Startup, and most recently, Side Hustle. In this podcast, Chris shares a different story each day about a regular, every day person taking the leap to start a side hustle. He shares their successes, their learning experiences, and their strategies, all in hopes of inspiring his listeners to get out there and do the same. While starting a side hustle might sound incredibly overwhelming, Chris takes away the “scary.” He breaks down the steps and highlights the importance of simply getting started. He also doesn’t preach the idea of “giving up your job” to realize the dream. No, he is all about the importance of creating a side hustle in order to bring in extra income and provide both additional security and a creative outlet. In addition to 7 episodes each week, Chris also does an “extended cut” about once a month. These episodes provide a deep dive into a particular question or subject in which his readers are particularly interested. They provide excellent, practical, and actionable steps in how to make your side hustle succeed. As the podcast progresses, Chris’s humor really shines, and I love it. You have to listen carefully though; it comes through in passing comments, small jokes, and goofy puns. I find myself laughing out loud quite often. Unlike the top two podcasts, each episode of Side Hustle School is generally under 10 minutes long. This makes it wonderful for binge-listening. I tend to save them up throughout the week and listen to all 7 on Saturday or Sunday while I’m out walking Bruno. If you’re a busy person with at least one job who’s looking to make some extra income, this podcast is for you. If you dream about starting your own side project but feel overwhelmed by the process, this podcast is for you. If your time is valuable, and you simply want smart, actionable strategies to get started, this podcast is for you. As Chris reminds us each episode: “Inspiration is good. Inspiration with action is even better.” If you’re thinking about starting a side hustle, take action by listening to this podcast. And that’s it, friends. 3 top podcasts that you will LOVE. Looking for more great podcasts? Check out 4 more of my favorite podcasts here! Do you love podcasts? What podcasts are you listening to? Which podcasts make your “top podcasts” list? Let me know below! Thank you for the post. I already listen to the first two so am going to give the third a go based on your recommendation. Great recommendations! I’m going to download them for my next road trip! The Takeaway sounds right up my alley right about now. I love getting these suggestions! thanks for sharing! Thank you for this. I was never really interested in learning about podcasts,however, after reading about your suggestion to listening to podcasts in my morning commute I was inspired to try it. I’ve since downloaded “The Happier Podcast” and will be listening to it on Monday’s commute! 🙂 I’ll let you know what I think! Hooray! I am so thrilled to hear this 🙂 Yes! Please let me know what you think!